Wendy’s parent interested in Krispy Kreme? ATLANTA Wendy’s/Arby’s Group Inc. and Krispy Kreme Doughnuts Inc. would not comment on a report Monday speculating that a deal may be in the works. An item in Briefing.com, as reported by Barrons, said that the parent of the Wendy’s and Arby’s fast-food brands was considering acquiring the 548-unit Krispy Kreme chain. Denny Lynch, a spokesman for Atlanta-based Wendy’s/Arby’s, said the company does not comment on market rumors. Representatives for Winston-Salem, N.C.-based Krispy Kreme did not return calls for comment by press time. Wendy’s/Arby’s has hinted in the past that it may be interested in acquiring a third brand, and with investor Nelson Peltz as its non-executive chairman, has a history of mergers and acquisitions. In June, Wendy’s/Arby’s closed on an offering of $565 million of senior unsecured notes, and the company said part of the proceeds could be earmarked toward the acquisition of another restaurant company. Wendy’s/Arby’s itself is the product of a merger between Wendy’s International Inc. and Triarc Cos. Inc. That deal, which closed last year, was valued at more than $2 billion. John A. Gordon, a financial consultant with San Diego-based Pacific Management Consulting Group, a group that focuses on the restaurant industry, said that the timing may be right for a merger between Wendy’s/Arby’s and Krispy Kreme. Wendy’s has been faring much better than sister brand Arby’s in the economic downturn. For the September-ended third quarter, same-store sales dipped 0.1-percent at Wendy’s North American stores. Same-store sales fell 9 percent at Arby’s. Wendy’s/Arby’s operates or franchises 6,608 Wendy’s units and 3,739 Arby’s locations. Krispy Kreme, meanwhile, has been struggling to turn itself around after years of battling legal problems with executive management and sluggish sales at its doughnut stores. In its August-ended second quarter, the company nearly broke even with a net loss of $157,000, compared with a loss of $1.9 million in the same quarter a year earlier. Krispy Kreme pointed to lower commodity costs and a 5.9-percent increase in same-store sales at corporate stores. Contact Elissa Elan at eelan@nrn.com. The investor who took control of Steak n Shake wants to rename the Indianapolis cheeseburger chain’s parent company for himself. Shareholders will vote at the annual meeting to rename their company Biglari Holdings Inc. The parent is now called Steak n Shake Co., based in Indianapolis, and its restaurants are a subsidiary named Steak n Shake Operations Inc. The proposed name change, disclosed in a filing last week with the Securities and Exchange Commission, follows Texas investor Sardar Biglari’s efforts to diversify outside the restaurant industry using cash from the burger business. Under Biglari, the parent company’s chairman, Steak n Shake Co. launched a hostile takeover in December of a Michigan-based insurance company, Fremont Michigan InsuraCorp. Biglari earlier fell short in efforts to buy Itex, a West Coast bartering business, and the California-based burger chain Jack in the Box. Renaming the parent could make it easier for Biglari to possibly spin off the Indianapolis-based restaurant chain in a few years without confusing shareholders, suggested restaurant industry analyst John Gordon, of Pacific Management Consulting Group, San Diego. Steak n Shake’s annual meeting will be April 8 at the St. Regis Hotel in New York. The burger chain, which has 485 sit-down eateries, surprised some analysts last week with its strong profit report. After-tax income of $5.49 million was reported on revenue of $147.58 million. In the same period in 2008, Steak n Shake posted a loss of $3.44 million on revenue of $130.72 million. Operating costs were relatively flat while sales revenue soared, Gordon said. To see more of the Indianapolis Star or to subscribe to the newspaper, go to http://www.indystar.com/. Many of you know I’ve been working complex restaurant analytical roles and engagements since the early 1980s. I’ve seen over that time advances in restaurant management systems, technology and data gathering has expanded exponentially. Restaurants today of course are complex blend of people, brand building and management systems bundled together; the outgrowth of this is numbers have become incredibly important. Unfortunately, a series of suboptimal restaurant analytical viewpoints, reporting and practices continue to be seen. The same issues seem to carry over from decade to decade. Such perspectives result in confusion; lack of lessons learned and misdirected effort. Here are five that I see regularly, and suggested solutions are posed. The comps trap. Everyone talks and worries about comps. Same store sales are typically calculated as percentage change of average unit sales over prior year period, for the units in the mature, “comp sales store base”. The press and investor community keys on it, a lot of decisions are driven by the comp. The problem is of course is that a one year view over last year is really a tiny snapshot. Let’s face it, weather, menu platform changes, competitive intrusion, national and global events happen every day. A better practice is to consider and report two year or even five year comps. This measure can be either “stacked” (values added together year after year) or on a compound annual growth basis (CAGR). If the sell side analysts keep focusing on the one year comp, report the longer measures anyway. As an example, look at the very current extract from the February 2016 Miller Pulse report, which shows the industry comps strengthening, not weakening, on a two year basis, versus the flat to negative January 2016 trend on a one year basis. A vastly different two year view! Transactions v. traffic v. customer count. Of course, the amount of traffic the restaurant generates is a vital number, which drives food prep and staffing in store. But is it people, entrees or number of times the grand total key on the POS was hit? Restaurants chains report it all differently. For drive thru or catering transactions, it might be hard to know exactly how many customers are served; for bar only customers, there might be many seconds or thirds served. Is each a transaction? Both Panera (PNRA) and Zoe’s (ZOES) have gotten into trouble with this lately; in 2013 and 2014 Panera had rising entrée counts but reported the number “parties”, that is the number of times the grand total key was pushed on the POS was down. Zoe’s had good comps but flat traffic because catering was up. Was that really a problem? If Panera got big table sizes in, they didn’t get credit for it, and the Investment Community became worried. The practice that Ruth Chris (RUTH) utilizes is pretty simple; report the number of entrees sold as a proxy for customer count. A conversion factor for catering can be set (and updated annually), drive thrus might be too hard, but every sophisticated QSR brand has the ability to track the number of “menu units sold” and can be noted as color in earnings calls. Dollars versus percentages: restaurant managers are taught percentage analysis early on; a fantastic amount of discussion and attention throughout the industry occurs to food cost and labor percentages; percentage restaurant margins are discussed endlessly. Investors get percentages but have to be told a fuller story. Sometimes, merchandizing and even refranchising decisions are justified on a percentage basis; e.g., the franchising margin percentage is greater than that of operating a restaurant. But what about the dollars? A unit with high profit percentages but low dollars profit per store is not the goal. A percentage is simply one number divided by another, it is a just a relative measure. The problem is of course percentages can’t be taken to the bank. The powerful effect of average ticket and gross profit cents per customer is not recognized if the focus is to percentages. The suggestion is to supplement “profit cents per customer” or even average weekly store contribution margin dollars per week as metrics, something to get the focus on dollars. Misleading marketing event analysis. A lot of promotional events are underway right now, one QSR brand is running three concurrent major promotional efforts (for example, Restaurant Brand’s International’s Burger King (QSR) is fighting the burger wars) that makes it confusing to detect what worked. There are a multitude of improvements possible in restaurant marketing analysis. First, brands can find and set a control market and measure impacts to remove “noise” from the promotional review. Not all brands do so. Secondly, more attention to measuring the AUV impact after a promotional window ends is needed. Restaurants are open long after the promotional event ends. In my thirty plus years, I’ve rarely seen reports of the “post promotion lift”. And if the marketing event media spend is expensive, advertising expense over and above plan should be treated as a variable expense and subtracted from the sales lift and other variable expenses in figuring out whether the event worked. And finally, the promoted item hit rate itself is interesting but unless it drives sales and profits higher, it is just an incomplete metric. It is not the measure whether the media worked. To its credit, Burger King, which just announced its Hot Dog rollout, tested the dogs in five markets and had a control market. Honest testing and data gathering does wonder in building credibility in a franchised system and in a company operated system to read and learn from the results. Remodel tracking and the first year sales pop: sales are vital of course, and remodels typically (but not always) drive incremental sales. But for how long? The first year lift gets all the attention (example, Wendy’s reported this week its Image Activation (IA) program returns are now lower than what they started with) but incremental sales and profit flow through are needed for years thereafter. To be sure, stores that aren’t remodeled will trend negative over time, so the change from doing nothing (negative AUVs) to the actual lift is fairly included in the sales and profit lift analysis. Setting the right analytical perspective is also important in the heavily franchised brands; the franchisees fund the CAPEX. Answers like “remodeling is in the contract, so we won’t talk to that” (see Dunkin Brands example) is not productive. For example, to its credit, in 2015 and 2016, Panera (PNRA) had excellent displays of the sales and profit impact of its Panera 2.0 initiative that helped explain a very complex undertaking. Suggestions: keep and track the multiyear sales and profit lift trends, publish to franchisees for their planning. About the author: John A. Gordon is a long time restaurant analyst and management consultant. He founded Pacific Management Consulting Group in 2003 and works complex restaurant strategy, operations and financial management analytical engagements. What Does Restaurant Refranchising Mean? In 2014, McDonald’s (MCD) announced it was to refranchise up to 1500 units out of the United States. In 2013, Wendy’s (WEN) announced refranchising of 450 units in its non core markets. In 2012, Burger Bing (BKW) and Jack in the Box (JACK) kicked into serious refranchising, so much so that Burger King now only owns and operates the 50 plus units in Miami out of a 130000 unit total. Even Starbucks (SBUX) is finally in franchising for its flagship Starbucks brand, refranchising stores in the UK and Ireland. It franchised its non premium Seattles Best Brand for some time. YUM has been furiously refranchising since 2009 but intends to keep China company operated. To be sure, some brands have been defranchising—buying franchised stores back. Red Robin Gourmet Burgers (RRGB), Noodles (NDLS), Qdoba (JACK) and Texas Roadhouse (TXRH), among others. Chipotle (CMG) wont franchise—it would destroy its culture and they make more as company operated stores. The debate in restaurant circles about the proper mix of company and franchised units has been legendary. In the 1970s and 1980s, the trend was towards company owned locations. In the 1990s, as return on invested capital (ROIC) and awareness of the free cash flow expanded, refranchising picked up. Refranchising means the company can make more on the royalties, maybe rent spreads (if it owns the real estate) and reduced G&A and capital expenditures (CAPEX) associated with its former units. In almost every case, refranchising involves weaker stores beyond a certain profit or EBITDA point or weaker brands or geographies. Refranchsing can be a stock catalyst, some new news, particularly if it funds increased dividends or buybacks, or if it is associated with more debt that can fund dividends or buybacks. That what McDonalds is doing. Optical improvement: refranchising takes the lower stores out ofn the base, and optically makes restaurant sales and margins improve, as both WEN and JACK have noted. Boost ROIC: with units sale proceeds and capital investment falling lower or to near zero if no real estate is involved, it provides a bump to ROIC. The ultimate problem is the company becomes an outsourced restaurant provider—no expertise in running restaurants. Franchisees site “no skin in the game” as a perennial problem in brand management. Adaptability/Flexibility: franchised concepts take longer to get new products to market and keep the physical plant remodeled and renewed. In the US, Starbucks will always have an advantage over McDonalds as it can make decisions and implement market change quickly, while in McDonalds case it takes years to attain buy in and effect market change. Unit level economics: while there is the perception that franchisees run a tighter P&L,than company operations, franchisees do have to pay a royalty and are generally territory constrained. In addition, the availability of funds and cost of debt for franchisees typically are unfavorable versus that of the franchisor . This implies higher cost of debt and missed opportunities. Franchisees have higher debt to EBITDA ratios. For example, the McDonalds US franchisees debt/EBITDA is appx. 5.4 X, versus 2.2X at MCD corporate. Company structure; good franchisors run their company units as a training and development ground for franchisees. If the company store base is deteriorated or nonexistent, quality development staffing comes at risk. Once the refranchsing is done, that arrow is no longer in the quiver. What next? Cultural bifurcation, franchisor v. franchisee conflicts. To any close observer of the ongoing Darden (DRI) conflict as it has unfolded with its opponent activists Barington, and Starboard since late 2013, a Red Lobster sale to private equity was not a shocking outcome. • Private equity has dry powder–unallocated funds– available that it must put to use to earn a fee. Golden Gate had owned three restaurant brands and continues to own one, California Pizza Kitchen. • Darden, which was in trouble since at least 2007 trying to hit a 15% EPS model with the mature Red Lobster and Olive Garden restaurant brands, bought a lot of restaurant concepts at high price in 2008-2013, and wound up with a lot of debt. As the rate of casual dining traffic decline fell after the Great Recession, (Darden noted the casual dining overall space traffic fell 18% versus the peak) and core earnings fell, it had both dividends and buyback demands going up at the same time. A true cash flow squeeze resulted. • Red Lobster had underlying real estate that could be levered to lower the effective Golden Gate purchase price. The question, is what now to do with Red Lobster? What are the “Lobster Levers”? On the positive side, the brand ratings are not weak. It ranks roughly in the middle of the pack via the 2014 Brand Keys Customer Loyalty index but near the top of the 2013 Q4 Goldman Sachs Brand Equity Survey. The downside is there are no other national seafood players to steal market share from. Bonefish (Blooming Brands, BLMN) is just growing and Joe’s (Ignite Restaurant Group, IRG) has built its own crab niche. It’s not going to work its way out of trouble with more $10 television advertising that it has been pounding way with this week. It’s going to have rent to pay. Darden has noted Red Lobster’s customer base indexes older and lower income than the most desirable casual dining peers; it’s got 706 units in an overbuilt US restaurant space. Keeping the same units and doing the same thing won’t solve anything. Close some units. Now that it is private and protected from the intense investment community focus on every metric, it can examine its store base. Note that American Realty executed sale leasebacks on 500 of the 706 units. A number of units were excluded for a reason, some were leased, some undesirable to do so. Red Lobster reached its unit count peak in the US in 1996, at 729 units. It then closed 75 stores over the next four years, to arrive at 654 units in 2000, to then slowly grow again until 2013. The natural US unit cap seems to be much smaller than 700. A privately held company can work this. With a rather low 9% reported adjusted brand EBITDA, the law of large numbers is that must be a number of units that are in the lower profit quadrant that upon closure, could result in positive cannibalization, and will improve the overall brand average profile. Test and rebred. Maybe because it was part of the central heritage of Darden, other than remodeling or wood grilling, there has been no real new concept ideation for years. A self serve Red Lobster lunch platform and Red Lobster/Olive Garden combo stores were tested recently and were a total waste of time and money. Such poor quality tests are indicated of a big concept ideation problem. Too much seafood on the menu and a very low level of alcohol sales are indicative of the problems. Work international. All of its peers are. Darden just began a brief foray into ex-Canada international and franchising in 2013. As late as 2013! Missing the international opportunity was a great strategic flaw. The US is filled up with restaurants. Can’t Red Lobster work internationally, somewhere? Work franchising, joint and limited partnerships. Darden’s problems with franchising went all the way back to a failed franchised venture in the 1970s. Franchising is difficult, well funded and capitalized franchisees have to be found. Darden said they didn’t have the expertise. But it can be found. A new management mindset embracing franchising has to be developed. It can work in casual/fine dining: Ruth Chris (RUTH) has had 50% of its stores franchised to solid players forever, and Cheesecake Factory (CAKE) is working franchising and joint venture partnerships to get its international growth jump started. The Cheesecake founder, restaurant operator, David Overton “got it”, but Clarence Otis, who didn’t have the restaurant operations baked into his DNA, didn’t apparently. But for franchisees, the stock price is not the same as free cash flow in the pocket. At Dunkin Brands (DNKN, Dunkin Donuts) for example, the DNKN stock price has more than doubled since its 2011 IPO, but core northeastern franchisee shop level profits are up 1-3% since 2008, per management. Same store sales: Despite some same store sales headwinds caused by the so called 2013 same store sales cliff, the theme noted http://seekingalpha.com/article/1111341-restaurant-conditions-comp-cliff-coming early this year that sales comps would be down versus mild winter weather in 2012, the industry is doing fine. There are no large publicly traded restaurant companies in real trouble, although one could argue Ruby Tuesday (RT) is, but not any of the major players from a liquidity or default basis. 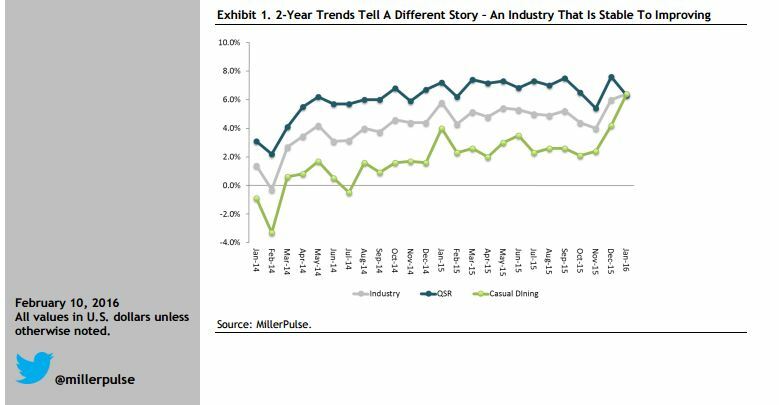 The industry was at +2.5% SSS (per MillerPulse) in May, almost all driven by ticket. McDonald’s (MCD) May sales gains reported Monday were foreseen and no surprise. Yum’s (YUM) -19% May China same store sales decline was not moderate but met the Consensus Matrix number. http://finance-yahoo.com/news/yum-says-sales-fell-2051586651.html. In almost all cases, the two year and five year comps trends are solid; if that was the Street metric we’d all be celebrating. See the following trend sales display from RBC’s Larry Miller’s MillerPulse Survey. Legend; two year comparables are the May 2013 v May 2011 comparison. Positive same store sales and traffic, both, with no major geographies negative. Meets or beats on analyst revenue consensus, beats earnings per share (EPS )by $.01 or more, with no downgrades within 90 days. Positive sequential momentum, early peek SSS current period, if revealed, positive. No gimmicks with adjusted, proforma or restated EPS values, and as validated by the operating income beat. A publicly traded track record of one year. Who are the Standouts: SBUX, with new product new news every quarter, the only restaurant chain growing traffic at a greater rate than average check. Also, Ruth Chris (RUTH), Texas Roadhouse (TXRH) Domino’s (DPZ) and Popeye’s (AFCE) are on the standouts list. Both Ruth Chris and Mitchell’s in the RUTH house are moving, ahead smartly. AFCE is building company stores, capturing US KFC units and reflagging them, and touting itsUS stores franchisee 20% EBITDAR margins, in addition to new flavors/new product news. AFCE was the first franchisor ever to report franchisee profitability in a quarterly call that I can recall. Implications: My number one concern going forward is that the industry not shoot itself in the foot via over discounting. NPD noted that after a time, customers see discounted prices as the new normal. Restaurants that don’t play in the ever discounting spiral space are at an advantage. Restaurant marketing tends to be copy cat in nature, and like a battleship, takes forever to turn. Darden (DRI) has reset to the $12.99 television price point, doing Red Lobster and Olive Garden $3/$4 off coupons too. US Pizza Hut (YUM) is doing $5.55 anniversary pizza price (one large) undercutting even Domino’s (DPZ) and weaker QSR players are at or under the “my $.99” at Wendy’s (WEN). We wonder what customers must think of the long term pounding on price. NPD https://npd.com/wps/portal/npd/us/news/press-releases/deals-are-no-longer-driving-restaurant-traffic presented five year data that shows that restaurant deal sales mix is flat and declining, as follows. This means more discounting is chasing even fewer deal consumers. Restaurant Financial Analysis: How Useful is the EBITDA metric? In the restaurant finance world, the big number is the EBITDA—EBBADABADOO as some call it. EBITDA is earnings before interest, taxes, depreciation and amortization, and is really a sub-total to the income statement. It is earnings without any charges for cost of funds, taxes or capital spending. EBITDA’s use began popularized as a credit metric, used in the 1980s M&A and credit analysis world—to test for adequacy of debt coverage. EBITDA is often the common denominator to track and report company buyout values: the acquisition enterprise value to EBITDA ratio is a very commonly reported metric. So much so that that’s where the focus goes. And its use as a simple business valuation tool: the company is worth some multiple of EBITDA; the higher the multiple, the higher the price, and vice versa. In the franchising space, where franchisors might report a simple EBITDA payback for an investment, or report EBITDA value in their franchise disclosure document item 19 section. The special problem there is this EBITDA is stated in terms of the restaurant level profit only—before overhead. Really, the problem is this: EBITDA doesn’t show the whole picture. It is a sub-total. It doesn’t show full costing. EBITDA alone as the metric misses at least eight costs and expenses, that are vital to know, calculate and consider in operating and valuing the business as a cash and value producer. Using a business segment such as a store, restaurant or hotel as an example, here are the eight required reductions to EBITDA that must be subtracted, listed in order of magnitude of the cash outlay, to really get to operating economic profit. Future year’s major renovation/remodeling: once the storefront is built, it has to be renewed and refreshed in a regular cycle, often every 5-10 years, via capital expenditures (CAPEX). That often is 10-30% of the total initial investment, or more, over time. Taxes, both state and federal. Financial analysis often is done on a pre-tax basis as there are so many complicating factors. But the reality is the marginal tax rate is about 40%. You might say…these other costs and expenses are common sense, they should show up in the detailed cash flow models that should be constructed. Or they can be pro-rata allocated. But how times does this really happen? The EBITDA metric becomes like the book title….or the bumper sticker that gets placed on the car. You really do have to read further or look under the hood. And the saying is true…whatever you think you see in EBITDA…you need more. Author john7357Posted on June 28, 2013 January 26, 2018 Categories 2013Leave a comment on Restaurant Financial Analysis: How Useful is the EBITDA metric? In watching the Q2 2012 restaurant space earnings, six brands interested us by exhibiting what we define as outstanding operating tempo (OPTEMPO). Not only significant EPS beats of $.02 or more (meets or a penny over doesn’t excite us much), but also positive traffic and positive early peek Q3 trends—that early Q3 trend prerelease info that some companies give. This quarter’s entire group has performed well recently. Common Denominators: Two casual dining operators, one fine dine operator, one bakery/café, one QSR pizza, one Chicken QSR operator. Two of the six are steak centric (RUTH, TXRH), with one other making inroads into higher steak menu mix (EAT). No big restaurant conglomerates (ala’ DRI) involved, but of the two with two brands under the HOLDCO, one brand greatly predominates over the other (EAT: Chill’s v. Maggiano’s) and RUTH (Ruth Chris v. Mitchell’s). Steak centric: we noted in 2011 that steak centric operators did well, no doubt by the improving travel/expense account traffic. RUTH’s peer, DelFrisco (DFRG) via its first call since IPO noted +SSS of 5.1% and traffic of +2.2% at the flagship Double Eagle units. Positive traffic and early peek looks: All had positive traffic—RUTH greatest at +3.9%; AFCE and PZZA don’t reveal traffic/check but one can so deduce it was positive). All had consensus earnings move up $.02 or more over the last 90 days—PNRA highest at +$.11, PZZA +$.09, EAT +$.07. Three of the six had 5 analysts or less providing estimates, with PNRA, TXRH and EAT well in double digit analyst coverage territory. None of these chains had eyeball high debt. Interestingly, none of the chains was actively refranchising, all were growing company units, with even franchisee heavy AFCE planning a significant slug of new company units. Four of the six chains (RUTH, AFCE, PNRA, PZZA) had positive free cash flow increases from quarter to quarter. EAT and TXRH free cash flow was off from prior year but EAT is doing heavy duty remodels (and is still a huge cash generator) and TXRH is building new units. The cost effect will be felt in 2013, and beyond. This comes on top of an up/down/up cycle from 2007. Depending on concept, restaurant cost of goods sold is typically 30-40% of revenue, the largest expense. Restaurants might cover moderate levels of food inflation, but if labor or other operating costs rise, and if revenues fall and produce deleverage of fixed costs, a real problem exists. We think the ‘low hanging fruit’, the easier to implement, plate centered cost savings actions have already been taken. Many restaurants have already reacted, in the recessionary 2008-2009 period by trimming portions and prices and by featuring lower cost per pound items and “small plates” in their menu and promotional mix. CKE Restaurants, for example, rolled out turkey burgers, and pork, lobster, chicken and other items have been periodically featured elsewhere. PF Chang’s implemented expansive happy hour food and alcohol offerings. Many restaurants have already attacked staffing costs mercilessly, such as Darden, which eliminated bussers nationwide, expanded tip credit and is recertifying servers in massive workforce reorganization. Sonic (SONC) expanded the tip credit, lowered wages for some and rolled out car hops on roller skates to enhance service (and tips). What to do? The show must go on of course. Other than price increases, which always has to be considered in relation to competitors and customers, more work on menu mix and the rest of the P&L has to be considered. Here are some ideas from our travel and research. More work towards developing store, zone, and regional pricing tiers needed: most US restaurant chains grew out of a 1960s/1970 culture of mass conformity. It is what the newly traveling public demanded in reaction to inconsistent restaurants in the 1940s-1960s. The US today is has a far more diverse population, competition, operating cost and real estate characteristics. Pricing really need not be the same everywhere in every location, either in a DMA or in a region. Ask ABC stores, the famous convenience retailer in Hawaii how they invented store level pricing. Does a Subway customer expect exactly the same price to the penny for a sub everywhere in a DMA? Mass television campaigns can be much more carefully conceptualized. This is where the rub really comes. Conventional marketing theory holds that price specific advertising works better than “culinary” or other message focused advertising. Example; see Darden’s recent Q4 2012 earnings explanations of the Olive Garden sales softness. And what about $1/$2/$5/etc. off marketing features? That way no specific price baseline must be noted. What is done with mass television campaigns and repositioning has to be tested. Just must. There is much less time, money and customers for massive redos. Ask Ron Johnson and JC Penney’s (JCP) about the cost of customer confusion in the wake of their massive repositioning (and the negative 20% same store sales resulting), that we understand was not pre-tested. Suggestive selling at the store level always needs a lot of work. While few of us really likes to sell, renewed emphasis to not downsell once the customer is in the store (“oh…would you like the coupon offer?” or ban the comment “is that all” have to be helpful. There can be at least one universal tradeup question that even a shy person could ask over the drive thru. Get the remodel funding in place. Some franchisee centric chains which haven’t remodeled because of sub-par unit economics will be under severe strain. Now is the time now to strengthen system fundamentals and get franchisee financial assistance support processes in place. Papa John’s (PZZA) gets it, and has done so, but Domino’s (DPZ) hasn’t broken that code yet. Finally, there are other cost savings possible. My favorite is utility costs, particularly that of electricity (air conditioning) and water. Have you ever been in a restaurant where it was freezing cold after dark, or on a chilly day? There is a reason. Concerns on Wall Street over restaurant industry health, recently fueled by a sales miss from McDonald’s, may be to blame for CKE Restaurants’ decision to postpone its initial public offering, according to various sources. The planned IPO that was set to begin trading on Friday was called off late Thursday “due to market conditions,” CKE said. The Carpinteria, Calif.-based company operates or franchises 3,263 restaurants under the Carl’s Jr. and Hardee’s brand names. The company had hoped to raise more than $200 million with an offering of 13.3 million shares of common stock priced between $14 and $16 per share. A report on Thursday by the International Franchising Review, an online publication of Thomson Reuters Capital Markets Publishing, said CKE owner Apollo Management turned down an offer presented by the underwriting banks because it was too low. According to the report, which did not name sources, the offer by joint underwriters Morgan Stanley, Citigroup and Goldman Sachs was believed to be $10 per share. Earlier, the banks had communicated investor interest in the $10 to $11 range. Two days before CKE’s IPO was scheduled, Outback Steakhouse parent Bloomin’ Brands Inc. went to market with stock priced at $11 — well below the previous target of $13 to $15 per share. The size of the offering was also reduced to 16 million from the 21 million initially stated, and, though the stock price climbed through the week, some saw the situation as an indicator that investor interest in the restaurant space was cooling. Observers disagree, however, about the “market conditions” that might be scaring investors off. On the same day as Bloomin’ Brands’ IPO, McDonald’s reported that its global same-store sales in July were not positive for the first time in years. The quick-service leader reported that same-store sales fell 0.1 percent among U.S. locations, 0.6 percent in Europe and 1.5 percent in Asia Pacific, Middle East and Africa. Analysts blamed weakness in the global economy but also stiffer competition from competitors like Wendy’s, Burger King and Taco Bell, all of which have shown improving results. Concerns about beef prices next year may also have been a factor in the postponement of CKE, according to International Franchising Review. In earnings reports in recent weeks, several public companies said ground beef prices were expected to be favorable for the rest of this year as cattle are sent to slaughter because they are becoming too expensive to feed with the drought in the Midwest putting increasing pressure on corn prices. The long-term result, however, will be even higher beef prices next year, as it takes time to rebuild herd counts. Others said investors may simply have had enough of restaurant IPOs after a busy year so far. “The client base only has so many bullets to shoot at restaurant investments, and those bullets have been fired already,” said Lyon. CKE’s planned IPO would have been the fifth this year, following those from Bloomin’ Brands, Chuy’s Holdings Inc., Del Frisco’s Restaurant Group and Ignite Restaurant Group. Dunkin’ Brands Group Inc. also on Friday announced a secondary offering of 21.7 million shares by stockholders. Last year, Dunkin netted about $423 million with an IPO, selling 22.25 million shares for $19 per share, which was higher than the range initially set at $16 to $18 per share. John Gordon, principal of Pacific Management Consulting Group, said CKE’s large debt load may also have scared off potential investors. CKE was acquired in 2010 by Apollo Management in a $700 million deal. The company was planning to use income from the IPO in part to reduce net debt of $654 million to a projected $590 million. Since going private, Carl’s Jr. and Hardee’s have not been able to show strong signs of turnaround, as competitors Wendy’s, Burger King and Taco Bell have shown. CKE’s blended same-store sales rose 2.6 percent in the first quarter, which was “okay, nothing exciting,” Gordon said. CKE has a growth story to tell, Gordon noted, with plans to grow overseas and into the as-yet underpenetrated Northeast. However, those factors were not enough to overcome the changing outlook for restaurant stocks, which looks very different today than it did in May, when CKE first announced its IPO plans. “There’s no doubt things are looking worse now than they were in the spring,” he said. The question remains when, if at all, the IPO may still happen, if market conditions improve. Company officials said they could not comment on potential timing. The planned IPO was based on first-quarter numbers, and the company will likely have to re-file based on second-quarter results, which won’t be released until mid to late September. Analysts say investors balked at the firm’s debt load and poor growth prospects. CKE Inc. scrapped plans to take the Carl’s Jr. and Hardee’s operator public this week as investors balked at the poor timing, shaky financials and harsh head winds against the fast-food industry. The fast-food chain, which started as a hot dog stand 71 years ago in Los Angeles, was unable to persuade investors to buy into its initial public offering of stock. CKE postponed the deal at the last minute Thursday night, citing market conditions. CKE IPO: An article in the Aug. 11 Business section about a planned initial public offering by Carl’s Jr. owner CKE Inc. said that the company had stopped matching 401(k) contributions and that it had $1.5 billion in debt. CKE never matched employee retirement contributions, and it had $715 million in debt that was part of $1.5 billion in total liabilities. But analysts said the biggest reason CKE put off the IPO was that owner Apollo Management made a series of miscalculations that scared off investors. Critics said CKE, loaded with $1.5 billion in debt, was just not ready to go public. This would have been the second time that CKE had gone public after founder Carl Karcher listed the company’s shares in a well-received IPO in 1981. This time around, the Carpinteria fast-food giant is a drastically different company. Apollo bought CKE and took it private two years ago for $700 million, then began taking on massive amounts of debt. Much of the money Apollo would have raised in the IPO was expected to pay down junk bonds that the firm used to acquire CKE. The company had expected to raise $200 million during the IPO, and Apollo would have remained its biggest shareholder. In addition, Apollo paid itself $190 million in dividends from CKE last year, according to regulatory filings. That includes $13.8 million that CKE would hand over to Apollo to end a management services agreement. The scenario is typical for private equity firms, which use debt to pay themselves earlier and then cash in again after an IPO. Most private equity takeover teams wait four or five years before releasing companies onto the public markets, giving them time to stabilize away from the public eye. Another financial factor that weighed on investors is that CKE has not shown an annual profit for two years, and in 2011 suffered a $19.3-million loss. Although sales have grown modestly, much of the company’s cash has been used to pay interest on the debts it owes. CKE, in an effort to cut costs, even stopped paying matching contributions to employees’ 401(k) retirement accounts. “The company’s weak financials made the IPO as hard to digest as some of the fast-food it serves,” said IPO research firm PrivCo Chief Executive Sam Hamadeh, who added that he had spoken with investment managers who passed on CKE. Another fumble for Apollo and CKE was the IPO’s timing, analysts said. Early August has always been a slow period for such launches, with much of Wall Street on vacation and the remainder worn out by the debuts that tend to swarm the market earlier in the summer. CKE would have been the fifth restaurant company to go public since June. The most recent, Outback Steakhouse owner Bloomin’ Brands Inc., launched Wednesday. But shrinking demand forced the company to price at $11 a share, below its originally expected $13-to-$15 range, while selling fewer shares than it had hoped. Both CKE and Apollo planned to offer about 6.7 million shares. After Bloomin’ Brands’ subdued debut, analysts said investors probably balked at CKE’s price range of $14 to $16 a share. Indeed, there’s heavy competition from younger brands such as Smashburger and Five Guys Burgers and Fries, which have ambitious expansion plans and more buzz. Although CKE has been pushing its store remodeling efforts and international development, its existing base of more than 3,000 locations makes analysts skeptical that it is capable of a major growth spurt. CKE has also struggled to distinguish itself in recent years, according to research. Hardee’s and Carl’s Jr. are outranked in sales by chains such as Wendy’s, Jack in the Box and Dairy Queen, according to QSR magazine. Carl’s market share of the burger segment fell below 2% last year for the first time since at least 2005, compared with Burger King’s 12% and McDonald’s 49.6%, according to research group Technomic. It was unknown whether Apollo will revive the IPO at a later date. But if CKE does list its shares on the New York Stock Exchange, it would be a far cry from the first time the Southern California native debuted publicly in 1981. Back then, a heady sense of optimism pervaded the $15-million-a-year enterprise, said Loren Pannier, who was then serving as chief financial officer. Chuy’s Holdings Inc., the casual-dining Mexican restaurant operator, debuted on the public market Tuesday, bucking a down market to close up 15.9 percent. The 36-unit Austin, Texas-based company offered 5.8 million shares at $13 each, the top end of its forecasted price offering between $11 and $13 per share. The stock closed Tuesday at $15.06, boding well for upcoming restaurant public stock offerings, including Southlake, Texas-based Del Frisco’s Restaurant Group, which is scheduled to debut on the market Friday. In comparison to Chuy’s first-day spike Tuesday, the Dow fell 0.8 percent and Nasdaq fell 0.9 percent. Wall Street darlings like Chipotle and McDonald’s were also hit hard by investors as the companies reported depressed sales and earnings news. Proceeds from Chuy’s offering will be used to pay down debt and add new restaurants, Steve Hislop, chief executive of Chuy’s, said in an interview with Nation’s Restaurant News after the chain debuted on the Nasdaq market. Market-wide, five IPOs went up last week and eight are scheduled this week, including two restaurant companies — Chuy’s Holdings and Del Frisco’s Restaurant Group. Del Frisco’s, which operates the Double Eagle Steak House brand as well as the Sullivan’s Steakhouse and the newer Del Frisco’s Grille, said it plans to sell 7 million shares at between $14 and $16 per share. Del Frisco’s plans to offer 4.3 million shares and parent company LSF5 Wagon Holdings LLC, which is owned by Lone Star Funds, will offer 2.7 million shares. The company, which tried to go public in 2007 but withdrew its application in December 2008, again filed for an IPO of up to $100 million in January this year. Other public offerings in the wings are those from Outback Steakhouse parent OSI Restaurants of Tampa, Fla., which said in April that it will change its name to Bloomin’ Brands and seek a $345 million IPO. Cheddar’s Casual Café of Irving, Texas, which used a provision under the Jumpstart Our Business Startups Act to file confidentially for its IPO in May, is also on the blocks. Dallas-based Dave & Buster’s Entertainment Inc. filed for an IPO in 2011, but it has yet to come to market. CKE Inc., which operates the Carl’s Jr. and Hardee’s burger chains, had filed for an initial public offering of up to $100 million in May and on Monday said it now expects to raise as much as $230 million. CKE was taken private by Apollo Management in a $700 million deal in 2010. Shares in Ignite Restaurant Group of Houston, which owns the 127-unit Joe’s Crab Shack and the 16-unit Brick House Tavern + Tap, went public in a $83.8 million offering in May. The company’s stock lost more than 20 percent of its value last week when the company announced it would have to restate financial statements for 2009 to 2011, and the first quarter of 2012, because of accounting issues with fixed assets and depreciation expenses. The casual-dining chain most recently opened a unit in Gainesville, Fla., and is looking to back fill markets in Texas and Oklahoma, as well to colonize new ones such as Atlanta, Birmingham, Ala., and Louisville, Ky.
Hislop said the company, founded in Austin in 1982, expects future units to follow the non-cookie-cutter approach. “We’re going to follow our motto of ‘If you’ve seen one Chuy’s, you’ve seen one Chuy’s,’” Hislop said. Current units range from 7,000 to 12,000 square feet, and Hilsop said the lower end is likely to be the target for future development. The chain’s menu of burritos, enchiladas and fajitas produces a per person check average of $12.99, Hislop said, “which makes us very affordable.” The concept’s emphasis on rock ‘n’ roll music and in-store Elvis altars also positions Chuy’s differently than many Tex-Mex operations, Hislop said. A slowing of sales at Chipotle Mexican Grill in the second quarter sparked debate among Wall Street analysts and observers that Taco Bell’s new Doritos Locos Tacos may be to blame. Taco Bell introduced the new taco line, which feature shells made with nacho cheese-flavored Doritos, in March, and the product has been hailed as one of the company’s most successful. Last week, parent company Yum! Brands Inc. attributed a 13-percent increase in Taco Bell’s same-store sales during its second quarter to the launch of Doritos Locos Tacos. Meanwhile, Chipotle last week reported a less-than-expected same-store sales increase of 8 percent during its second quarter — a slip after seven consecutive quarters of double-digit same-store sales. Though Chipotle’s results overall were enviable, including a 61-percent increase in profit and a 21-percent gain in revenue, the chain’s typically high-sailing stock price took a plunge, losing nearly a quarter of its value on Friday. In a call with analysts last week, Chipotle blamed the sluggish economy and difficult two-year comparisons. In reports, however, Wall Street analysts pointed to a possible correlation between Taco Bell’s same-store sales rise and Chipotle’s relative fall. “We believe Taco Bell’s resurgence — at four times the number of units and three times the amount of system U.S. sales — may have had some impact on Chipotle,” wrote John Ivankoe of J.P. Morgan, who attributed Taco Bell’s lift to the “decidedly un-Chipotle-like” Doritos Locos Tacos. The Cantina Bell menu was designed by celebrity chef Lorena Garcia and includes a line of bowl or burrito options with new ingredients for Taco Bell that evoke the style of Chipotle — though they are more similar to what might be found on the menu at other fast-casual competitors, such as Baja Fresh Mexican Grill or Qdoba Mexican Grill. Taco Bell’s’ Cantina Bell offerings, however, are positioned at under $5 — a premium offering for the quick-service Taco Bell, but a value position compared with Chipotle and others. Still, he also warned of the Cantina Bell threat, citing “industry sources” who said the new menu is “off to a great start in terms of sales.” He quoted one Taco Bell franchisee who credited the Cantina Bell menu for double-digit same-store sales increases since the launch, which has been heavily promoted. John Gordon, principal of San Diego-based Pacific Management Consulting Group, however, does not believe that Chipotle fans suddenly jumped ship for a taco shell made of Doritos. Taco Bell’s impressive jump in same-store sales was likely in part because the chain had been lacking in “new menu news” for some time. Just as Burger King saw same-store sales rise significantly after announcing its menu revamp earlier this year, it should be no surprise that Taco Bell would see an “outside bump,” he said. David Tarantino of Baird Equity Research warned that Chipotle’s disappointing same-store-sales trends should not necessarily be seen as an indicator, saying his firm’s surveys of fast-casual chains do not suggest a broad-based pullback on consumer spending. Tarantino said the slowdown was likely company-based, possibly because of the tougher multi-year comparisons, as well as extreme heat conditions that might suppress the appetite for burritos and aggressive promotions by other quick-service competitors, though he did not specify Taco Bell. Though growth might be slower in the third quarter, Tarantino and others encouraged investors to take advantage of Chipotle’s lower stock price as an opportunity to get in on what will likely be long-term earnings growth. “We still consider Chipotle’s top-line growth prospects among the best in the industry,” wrote Stephen Anderson, senior analyst for Miller Tabak + Co. LLC. While the economies of its international growth markets, especially China, may be slowing down, Yum! Brands Inc. is going to market in the United States with new-product news that may bolster the domestic portions of its earnings, which the company will report next Wednesday. During the past several weeks, the company’s three brands — KFC, Taco Bell and Pizza Hut — have each rolled out new products that star in comprehensive marketing campaigns. The wave of menu innovation comes at a time when economists fear international markets, which generate 65 percent of Yum’s operating profit, could falter from recently reliable and robust growth. China, Yum’s key market, could be a particular concern. An Associated Press story reported Thursday that the country’s economy might only grow an expected 7.3 percent. While it would be an enviable figure for the United States economy, a growth rate below 8 percent would mark one of the lowest quarterly expansions in several years and signal weakening demand and consumer confidence. Austerity measures, a possible banking crisis and depressed consumer confidence also could hamper Yum’s outlook in its Yum Restaurants International division. If Yum were to look to the United States to make up some of the sales slack, recent performance and new products could be reason for optimism. After same-store sales for its domestic system fell 1 percent for fiscal 2011, they rebounded with a 5-percent increase in the first quarter of 2012. John Gordon, principal of San Diego-based Pacific Management Consulting Group, an analysis and advisory firm focused on restaurant chains, said Yum should be able to win back sales and trial with its new offerings, provided the company makes up for lost time in the United States and stays aggressive in its advertising. Take a look at some the most recent menu rollouts from KFC, Taco Bell and Pizza Hut, as well as analysis of how the offerings could affect Yum’s performance.